WOW what a year 2016 was! We had so many wonderful milestones during 2016 directly attributed to all the little ones that found our bike and have fallen in love with them. These are some of the milestones that we are grateful for and could not have achieved them without the support from our Pello community all across the US. After approximately 4 years of designing, developing and testing our bikes we successfully launched Pello bikes for sale in May of 2016. Right from the beginning people loved our bikes and felt a need to provide their children with a better bike. We let reviewers see our bikes for the first time and the response has been overwhelmingly positive. We can only smile when we receive praises from parents who purchased a Pello for their child. It makes us feel so good that all our work in making these bikes is paying off, kids are learning to ride on our bikes and that is awesome! We traveled to a lot of events in 2016, big and small, and set up our test track. It’s been so great to see little ones taking flight for the first time on our bikes! We are still logging miles on our very first prototypes; in fact our very 1st Rover is pushing 500+ miles from being passed around to friends and testers. We are happy to report that it is still going strong! We have successfully sold out of the Revo and are very limited on others! Stock will be replenished this Spring. In 2017 we will welcome Ripple and Reyes to the Pello Family. Still in development, these two new additions will be the smallest (balance) and biggest (24”) bikes in our lineup. We are so excited to release them into the world for kids to learn, ride and smile as they engage in the magic of riding a bicycle. We will be traveling to more events across the country in 2017 with our test track. We will be launching new cool things for sale on our website including new t-shirt designs, jersey’s, exclusive in-house designed prints and many more cool things. We will launch our “Loyalty” Program where members of the Pello family will receive cool things and get discounts on future Pello bike purchases. We could not have been successful without the support and help from our family and friends; we truly thank them for all they have contributed. Thank you again to all of those who have supported us in making 2016 such a great year, we look forward to making 2017 even better! If your child loves biking (or perhaps YOU love biking), then you want to make sure you are getting them a bike that they can grow their skills on. The 16” bikes on this list are truly THE BEST–lightweight, well-designed, and built to withstand abuse. 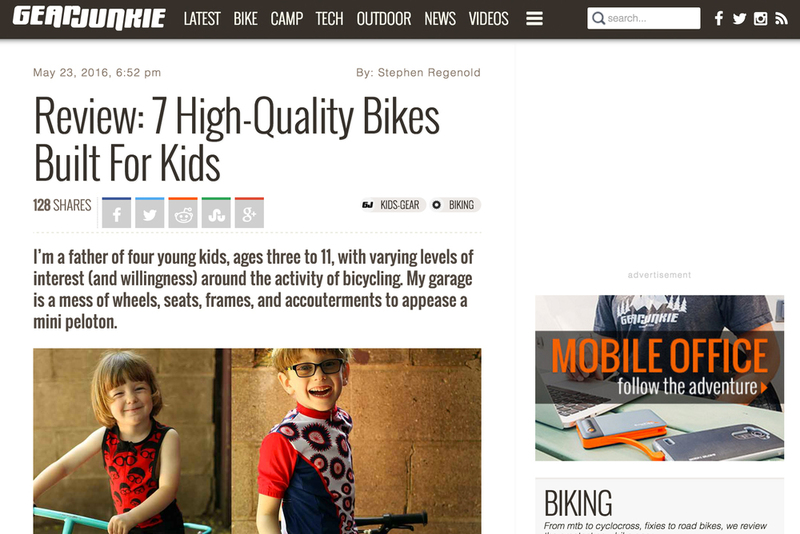 In general, 16″ bikes are most appropriate for your 5 to 7 year old. That said, if you have a tall 4 year old, they may very well be ready for a 16″ bike already. (More on how to measure your child for a bike later on). Read the full writeup HERE! Looking to get a jumpstart on this holiday season? Pello has your wheel. Use code PelloFreeShip at checkout and get free shipping on your next Pello, now through Sunday when you order from our Bike Shop at pellobikes.com. We are a local small buisness and we support other local small businesses so in addition to free shipping we also have 2 super cool I am RVA helmets to give away for the first peeps who tell us they want them. Simply say, "Helmet Please" in the custom fit section durring checkout and the first 2 orders gets them! They are size extra small for itty bitty heads. XS are for heads 18-20 inches around (47-51 cm). Remember these helmets have a mission. Thank you again for your support and we look forward to seeing you on the trail, street, sidewalk, park or wherever you may ride :)! Looking to try out a new pello? Check out the dates below to see where we will be this fall. Each of these events will feature our cool "Test Track" where we can fit your little one and let them try out a coo! new pello. Another Great Review of the Revo! Join us for a great time of hanging out and riding Pello Bikes. All bike sizes will be available to ride on our custom "car free" test track. In addition to testing a Pello, Shift Bicycles will be there with a complete lineup of thier cool Cargo bikes to test ride. We will have FREE food, drinks (Fresh-made Gingerale from Blakemore Brewing along with Pello Ale for the adults) and tours of our new shop. Bring the Family and head over to Pello Headquarters (10E 5th St, Richmond, VA)! Check out our facebook event also! See you there! Great article on explaining the differences between buying a bike from a bike shop vs online. A timely article as we tend to buy almost everything online, from cars to paper towels. Well it's been a long and fun journey to get to the point of having our bikes in stock and ready for little feet and hands to make them move! 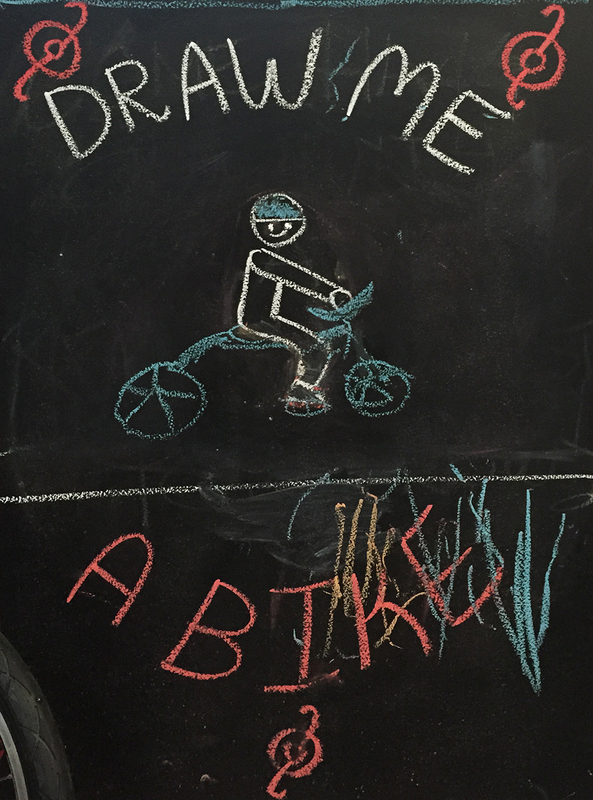 During this time we have developed the bikes to a point where we feel they really are the "Ultimate Kids Bike". We have gone through countless prototypes, several trips to various factories and worked with consultants in the bike industry to find that right combination of quality & craftsmanship we expect at the right price for our customers. All said this process has taken about 3+ years to achieve. When we started we thought it would be relatively simple to produce the bikes, however, once we really got into the meat of making a new bike brand it was a little more involved. Which is a good thing, just like kids learning to ride a bike, when the time is right they let you know, we to have taken our time to really think about how the bikes should be designed and started from the ground up to create each of our 4 models. We hope that you will find all the details in our bikes to be well thought out and most importantly help your little one experience the joy of cycling! Please feel free to check us out and give us a spin! We are proud to announce that our bikes are now available at the Outpost Richmond! The shop is located on the Southside of the James River and is adjacent to some of the best Trails in the Richmond area. Besides being a great bike shop the also carry awesome food, think of small corner market in NYC. The bike shop specializes in bikes for the everyday meaning they carry bikes that mom, dad and the little ones can all ride together. All in all a great shop in a great location! Check out their website to find out more and check out a Pello! Wow, 2015 is now behind us and we are looking forward to 2016! With a new year comes new news for Pello! The manufacturing process has begun! We will soon have our little bikes here for your little ones to enjoy and ride. Shane will be making a visit to the factory in March to ensure the bikes are exactly as we have specified. LAST WEEK IN APRIL, if all things go well this is when we will receive our bikes! We are going to open pre-orders soon where you will be to ensure you will be one of the first to receive a new pello when they arrive. We always encourage you to stop by our shop and test ride a pello, we have all models available to test ride, gaze at, or just see how well they are built for your self. Our address is 10 E 5th Street, RVA 23224, please email us to schedule a time. Thank you again for your patience as we have been working through our prototypes and ensuring every part is good enough to be for your little one. 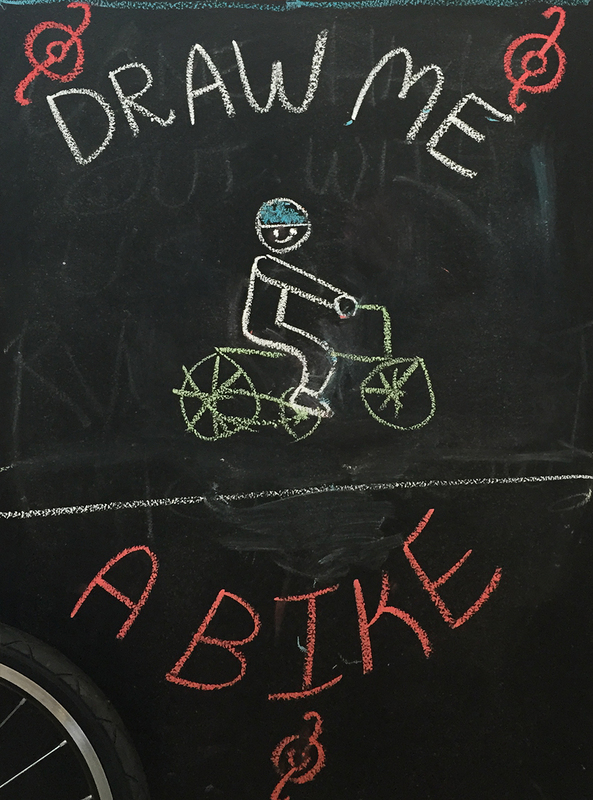 Happy New year and keep pedaling!!! 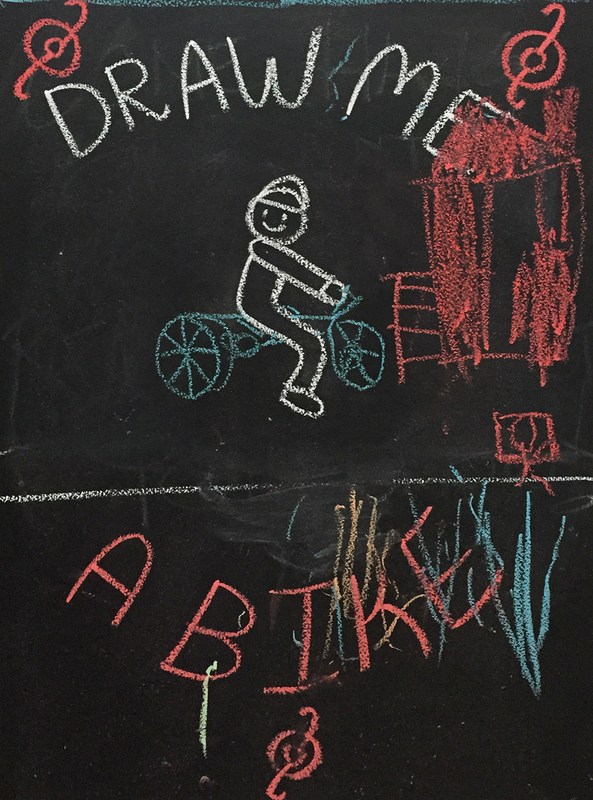 We had an awesome day at the Makerfest a few weeks ago, as part of our booth there we had a chalk board so visitor could draw their own version of a PELLO. We had so many great artistic contributions we decided to put them up as a gallery, click through the below images and enjoy the artwork. 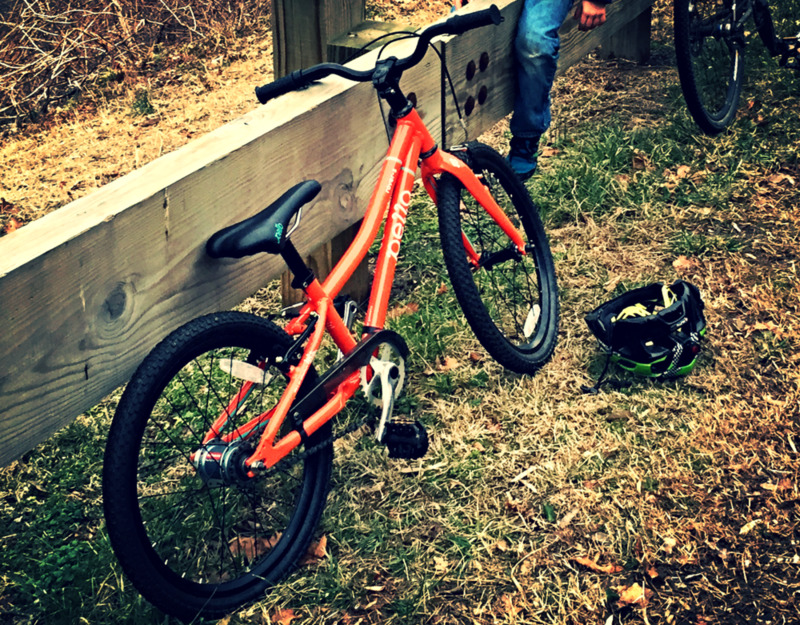 Shane & Chris here with an update on the Ultimate Kids Bike. Currently our focus is on finalizing the details for our cranksets. We are working with a leading crank manufacture to design our own cranksets that will tighten up the Q-Factor (the distance between the pedals). What this means is that the Cranks will be more proportioned to kids "hip" sizing making them fit better and have more fun riding. Once we have the crankset's dialed in we are then going to have a final round of prototypes built to ensure everything is up to our standards. It is our hope that we will have our prototypes in September. We are also in the process of getting T-Shirts (kids and adult sizes), little water bottles, and stickers made and should have all of this by the end of August. If you would like any of these items please let me know and we can work out the details on sizing, etc. Provided all the details are worked out with the prototypes we are still hoping to have the first batch of bikes in December!!! If anyone is going to be in Richmond, VA for the Worlds Road Racing Championships make sure you swing by and check us out at the Pop Up Revolution. We will have bikes on hand for little ones to ride and cool things to give away! If you are in Richmond at anytime and want to check out a bike, just let us know and we'd be happy to let your little one take a spin. We secured our Trademark of the name Pello!!! Shane will be in Colorado on August 15 competing in the Leadville Trail 100 Mountain Bike Race. If anyone is out that way and would like to chat about Pello let me know by responding to this email so we can connect! We will continue to update you on our progress of bringing the Ultimate Kids Bike to market, thank you again for your support! Please make sure to visit our Facebook page for updates. Thanks again everyone, Life's and Adventure, Let's Ride!